Since Galata has the privilege of being a harbour, is quarter as old as the history of Istanbul. Being a junction between east and the west, it has always been a vital point of economic movements throughout all history. Kamondo family was among the most distinguished bankers, those who centered in the economic structure of Galata. Felek Han is one of the investments of Kamondo Family whose richness, in their times, was compatible with European bankers such as Rotschild's or Hirsch's. Magnificent "Kamondo Stairs" of Kamondo's who had a great emphasis on the social life of the Ottoman Empire's last period, is well known by everyone. Kamondo stairs which is one of the roads to Galata Residence Apart Hotel's, was built in order to facilitate Family's life, after the birth of Mois de Kamondo, the fifth generation of the family. By the end of the century, the building was rented by "Aliens Izraelit Universel" to be used as a school. Felek Han which is altered to blocks from wood in 1882, was designed and structured by Gabriel Tedesch, an architect of the period. By the end of the century, the building was rented by "Aliens Izraelit Universel" to be used as a school. 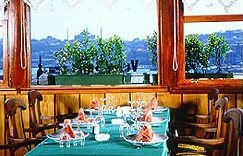 Later under the name of "Galata Residence Apart Hotel"
You will live in the mystery of the past and the comfort of our days in the new colour of Galata; Galata Residence floors, ceiling and the doors which, are restored in accordance with the attractive architecture of the building are fully original. The atmosphere of 1800's, with it's special decoration, is designed as a place where you can find various privileges and comfort all together. Galata Residence consists of 16 Aparts. Flats are with two rooms and a salon, and they all have fridges, ovens, TV, satellite channels, direct telephone, three radio channels, air conditioner, coffee machine, hair dryer and private safes. You will never forget that poerless impression, of where Marmara sea and the Golden Horn penetrates into each other in the Bosphorus, and taste of dlioios plates, made on you. In your all kinds of feasts, cocktail parties, meeting with or without meal, and special offerings, you will feel the difference of Le Felek Restaurant in it's distinguished atmosphere, it's 200 people capacity with a superior understanding of service.